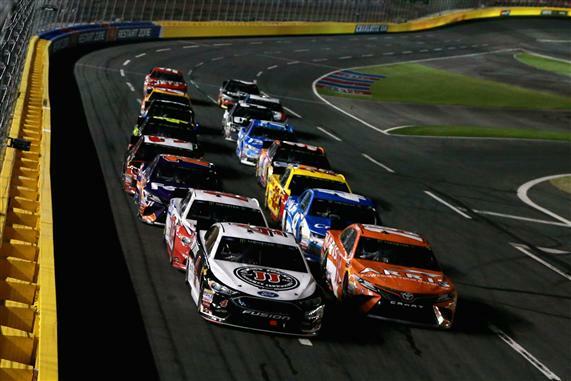 The new and improved Driver Group Game is set to be released for the 2019 NASCAR season. 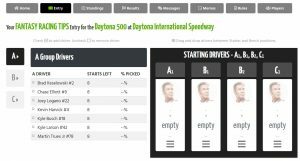 The game will have its own website this year (drivergroupgame.com), instead of the Fantasy Racing Cheat Sheet website it was played in the past. Make sure you update your “favorites” so you go to the correct site for the best Fantasy Racing in 2019. Your profile will be rolled over to the new website if you played the Driver Group Game last year. You will have to create a new password. Simply go to the “Log In” tab at the bottom of the page and click on “Forgot Password” to reset your password. All players from last year will be placed into the leagues they were in last year. You will be able to join a new leagues by using the tabs on the left (click “Join League” to be placed in a new league). Drivers are placed into one of three groups. Group A is the elite drivers, Group B is the contenders and Group C is the remaining drivers. Each week you will need to select Two Drivers from Group A, Four Drivers from Group B and Two Drivers from Group C. Before the race begins, you will set your starting lineup. You must select one of your Group A drivers, two of your Group B drivers and one driver from Group C for your starting lineup. Only your starting drivers will earn fantasy points during the race. GROUP A Drivers: Brad Keselowski, Chase Elliott, Joey Logano, Kevin Harvick, Kyle Busch, Kyle Larson and Martin Truex Jr.
Group C Drivers: Chris Buescher, Daniel Hemric, Darrell Wallace Jr., David Ragan, Jamie McMurray, Matt Dibendetto, Michael McDowell, Ty Dillon and any remaining drivers entered in the race. Each team can use a driver eight times during the season. Once you run out of allocations with the driver, he will not score any points for your team. Each league commissioner will have a lot more control over their Driver Group Game leagues this season. Commissioners will be able to change which drivers are in each group, change the scoring, change will races are used for the league and remove members from the league. 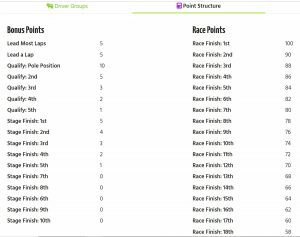 Customizable Groups will allow the commissioner to decide which drivers are in Group A, Group B and Group C. Commissioners will also be able to customized how many times each driver is used throughout the season. If you want more than the eight default starts, you can change it to 9, 10 or however many you want. Customizable Scoring will allow the commissioner to change the scoring for their league. 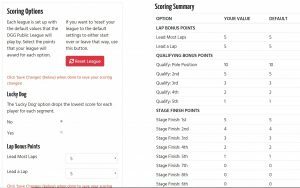 If you really liked the scoring system from the previous Driver Group Game or the Yahoo Game, you can remove the Stage Points and change the Qualifying Points to whatever you want for your league. You can also add the Lucky Dog (removes your lowest score) if you want to. Customizable Races will let each Commissioner choose which races to use for their league. If your league started up late, you could start with the race at Atlanta, Phoenix or Las Vegas or any race you choose. If you want to have a regular season league and a playoff league, commissioners can choose to have their leagues end at Darlington and a new league start at Las Vegas. Commissioners can also have a league of all 1.5-mile tracks, all shorts tracks or whatever they want. It is in your hands. * If you decide you want to go back to the default settings, the commissioner can simply click on the “Reset League” tab and your league will be put back to the Driver Group Game Default settings. 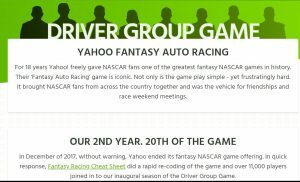 The Driver Group Game is setup to be the best Fantasy Racing game available to NASCAR fans in 2019. No one likes change, but the changes made will make your experience a lot better and give players more control over the game they like to play.